Four of the five Republican candidates for governor are on television with ads that offer dashes of biography with promises to cut taxes, shake up Hartford, cut state employee benefits, clean house, fight insiders, restore growth and, yes, think outside the box. All this in 30-second servings. Two of them, businessmen with last names that invite confusion, David Stemerman and Bob Stefanowski, use imagery of a wrecking ball named Gov. 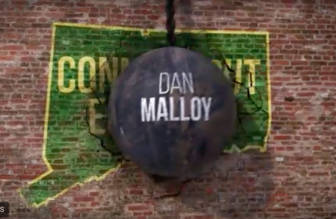 Dannel P. Malloy as the source of Connecticut’s problems. Timothy Herbst, a former Trumbull first selectman, says the state needs his leadership, vision and guts. Danbury Mayor Mark Boughton talks quietly about last year’s surgery, showing a CT scan image of a lesion removed from his brain. Stefanowski and Stemerman, two political newbies who have opted out of the state’s voluntary Citizens’ Election Program, which keeps participants on tight budgets built around $1.35 million in public grants, have been on the air for months. Obtaining their public financing on June 20, Boughton’s ads went up Thursday and Herbst’s on Monday. Steve Obsitnik, the fifth candidate, is off the air awaiting word from the State Elections Enforcement Commission on his application for public financing. Competing with summer vacations, they have five weeks to excite voters about a mid-August primary involving three men who never have held public office and two who have. None are household names, giving the ad makers the challenge and opportunity to define them with words and images that viewers will notice and remember. The mayor’s first ad tries to find advantage in a liability — any doubts voters might have about Boughton’s health after his surgery a year ago and seizure earlier this year. His surgery is a comeback story, and Connecticut could use a good comeback story, Boughton says. “You know, there are things you take for granted, until you are faced with losing them,” Boughton says in the spot. “A neurologist discovered a large mass inside my brain. I was told there was a chance I’d never walk or talk again. But I went to the best surgeon in the world, and with God’s grace and his steady hand, the operation was a complete success. The commercial is unlike anything on the air in Connecticut, a plus as the airwaves grow cluttered with ads. But it risks injecting doubts about Boughton’s health in some voters, even if it reassures others. Boughton says he thinks his forthrightness will silence any whispers about his health. His campaign is pivoting this week to a more conventional spot focused on his record as mayor of Danbury, a city of 80,000 that is the heart of a regional eight-town labor market with a 3.5 percent unemployment rate in May, the lowest of the state’s nine labor markets. The piece may strain credulity for some, flatly promising to eliminate the state income tax. Without precisely saying how he would replace the loss of Connecticut’s single largest tax, Boughton has said he would eliminate the levy over 10 years, a promise that would require winning three terms to deliver. In the commercial, there is no mention of a 10-year phase out. Boughton’s ads were produced by Nick Everhart of Content Creative Media, whose past clients included a Super PAC that supported the presidential campaign of Mike Huckabee, another that backed Paul Rand, and various interest groups, including Nebraskans for the Death Penalty and the Portland Cement Association. One ad that aired in Iowa for Huckabee featured two women, a Bible on the table, questioning Ted Cruz’s commitment to Christianity. Balanced budgets actually are a requirement for municipalities in Connecticut, and Herbst’s tenure offered taxpayers a mix of tax increases and cuts. When Herbst took office, Trumbull’s pension system was only 27 percent funded. Herbst shifted new employees to a defined contribution system and ended pensions for political appointees and the town’s chief elected official — him. He says the town made its entire actuarially required contribution to the pension fund in each of his eight years in office. The ad was done by FP1 Strategies, a soup-to-nuts political and advertising firm that also employs Jon Conradi, the general consultant to the Herbst campaign. The firm’s three founding partners are Danny Diaz, Jon Downs and Terry Nelson, alumni of at least one of the Bush-Cheney presidential campaigns. Stemerman’s newest ad is one in a series of spots that turns a verbal cliche of thinking outside the box into a graphic element — a transparent box that floats through all his commercials, this time constraining political insiders, but not him. It opens with Malloy behind the wheel of a crane with a wrecking ball. The business he “built from scratch” is Conatus Capital Management, a Greenwich hedge fund Stemerman closed so he could run for governor. The man behind his advertising is Russ Schriefer of Strategic Partners & Media. He was a full-time strategist and media adviser to Mitt Romney’s presidential campaign in 2012, but Stemerman was more impressed by the work he did electing Republican governors in blue states during tough economic times — Chris Christy in New Jersey in 2009 and Larry Hogan in Maryland in 2014. Stemerman, who calls himself a great admirer of the creative branding Steve Jobs managed on behalf of Apple, said the floating box will be a unifying image of his campaign advertising. A new element in his latest spot is subtle one: His first name, David, is more graphically prominent, an acknowledgement that voters sometimes confuse him with Stefanowski, a former senior executive with GE and UBS. Stefanowski’s new ad, which went up the same day Stemerman released his to the media, also opens with a wrecking ball representing Malloy, prompting sniping between the two campaigns. Stefanowski was the first on air, but Stemerman has been using the image in digital ads since the spring. The spot borrows more from children’s television than Stemerman: It brands him as Bob the Rebuilder, a play on the children’s show on public television, Bob the Builder. Stefanowski was a senior executive at GE, the chief financial officer of UBS Investment Bank and the chief executive officer of DFC Global Corp, where he says he drove a restructuring of the company, lifting profits from $40 million to $145 million in two years. He left the company in 2017. His advertising is done by Jamestown Associates, one of the GOP’s blue chip consulting houses. Its chief executive officer, Larry Weitzner, produced ads for Donald J. Trump’s presidential camapign, and Jamestown’s roster of clients includes Gov. Charlie Baker of Massachusetts and former Gov. M. Jodi Rell of Connecticut.